iMyfone Umate 2.9.2 Free Download - Clean iPhone/iPad storage by wiping off junk & temporary files, cache, etc. Clean iPhone/iPad storage by wiping off junk & temporary files, cache, etc. Last Updated: 8/30/2016 | File Size: 22768 KB | Price: $19.95 | Downloads: 119 | Developer: iMyfone Technology Co.,Ltd. iPhone storage full? Don't worry! iMyfone Umate will rescue you from the headache by reclaiming massive storage with its unique iPhone cleaning technology. iMyfone Umate iPhone Cleaner release your iPhone space by cleaning junk files, cache, temporary files, selectively deleting large video, photo, large apps and compressing photos without quality loss. It is a fast, efficient &amp; easy-to-use iPhone cleaner for all the iPhone, iPad iPod users. It only takes you a few steps to finish the cleaning process. 1. Support clean up 30+ junk Files to release space for your iPhone. 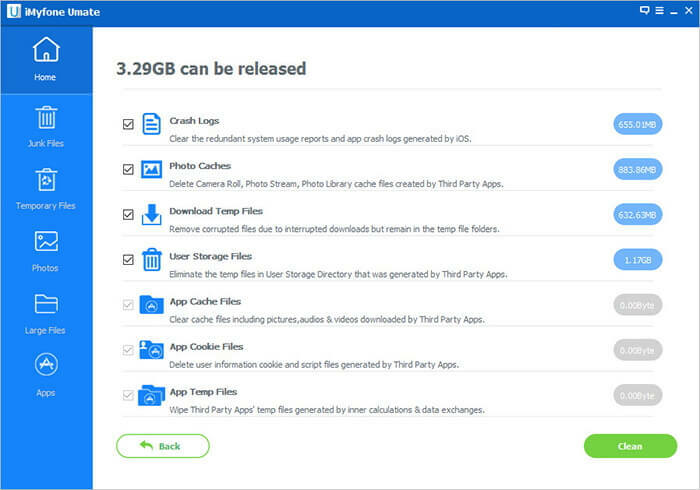 It helps wipe off app caches/cookies/temp files/crash log, downloaded temp files, user storage files, corrupted files, and even camera roll, photo stream and photo library cache files permanently. 2. Clean all the hidden temporary files, which eat up high storage of your iPhone, iPad, iPod. 3. Reclaim at least 75% Photos' Space by lossless photo compression and selectively photo deletion. You don't need to worry the quality of your photos after compression. The software will back up your photos on your computer before compressing and any deletion. 4. Backup large and delete large files to get your iPhone storage back. This software will scan your device and choose the files that are over 5MB for deletion according to your preference. 5. Manage and remove unused apps on your device. Some apps are downloaded but not often used. This software will find out these apps out. You can delete them to get extra space for your device. Statement: First, please download the orginal installation package by clicking the download link. Of course you may also download it from the publisher's website. Using iMyfone Umate crack, key, patch, serial number, registration code, keygen is illegal. The download file hosted at publisher website. We do not provide any download link points to Rapidshare, Hotfile, Depositfiles, Mediafire, Filefactory, etc. or obtained from file sharing programs such as Limewire, Kazaa, Imesh, Ares, BearShare, BitTorrent, WinMX etc. Software piracy is theft. If you like iMyfone Umate please buy it.